Educational policy, curriculum development, and instructional practices – all of these revolve around a central question – “What kind of a citizen does the education system aim at developing?” Traditionally, policy makers have focused on citizenship values within the national framework (as suggested in various National Education Commission, NCERT, and MHRD reports). However, this definition needs a revision because, in a globalized world, India is deeply connected with the international community. Based on my understanding of today’s knowledge-based economy and modern educational research on required knowledge and skills for the 21st century, I suggest that the following characteristics is what today’s citizen must have. He or she must: understand how the world works economically, politically, technologically, and environmentally (as suggested by Oxfam, 2006). be globally competent in his/her respective field of study. be able to identify and define problems, gather evidence, and produce knowledge. be capable of implementing knowledge-based solutions to the real world for sustainable development. be able to develop and maintain successful relationships based on mutual respect and acceptance with people of different religions, nationality, racial and linguistic backgrounds, and cultures. be able to identify personal interests with the collective interest of human society. be able to critically analyze and understand the difference between hate-propaganda, war mongering, and systematic injustice. be able to think globally, analyze nationally and act locally (based on Lynn Davis’ work on global citizenship). When we define a global citizen as described above, the aim of the curriculum changes in parts, if not completely. Though science and mathematics remain important, subjects like languages, commerce, and social sciences gain high value as well. 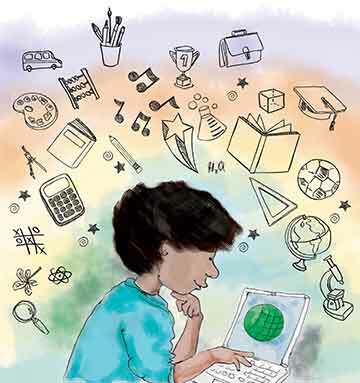 Curricula for math and science become inquiry-based, where students have to identify and define problems, form hypothesis, design experiments, collect and analyze data, infer results, and design improvement plans. The focus is more on the depth of learning, rather than its broadness. Like reading and writing, computer programming and coding become part of students’ required skill set. Education of history and geography needs a paradigm shift (based on John Dewey’s recommendations). The objective for ‘history’ should not be to glorify certain kings and describe wars, but to understand how wars are devastating for societies and why (and how) that should be avoided. The history curriculum should put higher emphasis on the lives and struggles of ordinary people of respective times, the challenges that they faced and the solutions they obtained. Similarly, geography needs to aim at conveying how geographical factors affect human lives, culture, economic investments, developmental plans of governments and respective environmental issues; and how the interlink of all factors in other regions are different from (and similar to) the learner’s geographic region. To inculcate critical thinking, the aim of teaching languages has to be beyond reading and writing skills. Audio-visual content, especially movies and plays, deserve a place in language curriculum. What and how much students are supposed to read and write must have a clear rationale. In addition to the local literature, there has to be some incorporation of great works from different parts of the world. Poetry writing, play writing, script writing, movie making, literary critiquing are all ignored aspects of linguistic competency in the present curriculum across various state educational boards – why is this so? Finally, in order to enhance students’ understanding of how the world works, high school curricula needs to be flexible. Students should be allowed to take interdisciplinary courses. For example, a science student may be interested in entrepreneurship, so why shouldn’t she/he be allowed to take a business course? Or a psychology student maybe interested in taking higher math course to learn matrix algebra which is essential for factor analysis of psychological constructs. In today’s competitive globalized world, we must give our students maximum learning opportunities. As suggested by Davis (2008), schools can encourage students to think globally, analyze nationally and act locally on various vital issues. A typical classroom may use elements of critical pedagogy where students are active participants in classroom discussions and the teacher’s role is that of a facilitator. The teacher must guide students’ inquiry rather than preach personal opinions. Global thinking: Are there accounts of Indians being discriminated abroad? (Explore cases of Indian students ill-treated in Australia/UK; labourers exploited in the Middle East and so on). Why is that happening? What do the native people think of the Indian community? National analysis: How does India treat immigrants? Explore the conflict between Bangladeshi immigrants and Bengali/Assamese people. What is the problem in Mumbai with internal migration? What are the factors forcing people to migrate? What is the central government doing to ensure a balanced growth of India? Local action: How is Ahmedabad/Gujarat dealing with international/national immigrants? How will it tackle immigration in future (as rapid development may attract skilled/unskilled people from everywhere)? Students plan activities to facilitate immigrants – e.g., meeting immigrant communities, inviting guests, visiting places where they encounter foreigners, making friends via Internet and exposure to other cultures, food, music, dances, movies. Note that the class discussions could be political in-nature. Therefore, it is imperative that the adolescents and youth are exposed to all sides of viewpoints while discussing a particular issue. Multiple perspectives from multiple sources may help them develop deeper understanding of the complex reality. For example, while discussing the Kashmir issue, one should look into the Indian government’s stand, the Pakistan government’s stand, the United Nations resolution as well as the viewpoints of various Kashmiri communities (people in the Valley, Jammu, Ladakh, and Gilgit-Baltistan). The incorporation of global citizenship, as defined in this article, in formal education has the potential for nurturing independent critical minds that are capable of working collaboratively for sustainable development, and producing (and utilizing) knowledge which can help resolve difficult issues. Bartlett, L. (2008). Paulo Freire and Peace Education. In Bajaj M. (Eds.) Encyclopedia of peace education (39-45). North Carolina: Information Age Publishing, Inc.
Davis, L. (2008). Global citizenship education. In Bajaj M. (Eds.) Encyclopedia of peace education (109-114). North Carolina: Information Age Publishing, Inc.
Oxfam. (2006). Education for Global Citizenship: A Guide for Schools. Retrieved from: http://www.oxfam.org.uk/~/media/Files/Education/Global%20Citizenship/education_for_global_citizenship_a_guide_for_schools.ashx. The author is a Ph.D. student in Educational Research at the University of Virginia. He pursued his M.Ed. at the University of Houston, and his M.Sc. (Physics) at Sardar Patel University, India. He taught Physics for two years at the high school level. He can be reached at kds5un@virginia.edu.